No one could compete with the majesty of Iron Maiden’s 1980s period. Come with us for an in-depth look at the making of Seventh Son Of A Seventh Son and the end of Maiden’s classic era. If Somewhere In Time (1986) signified a period of turmoil, with the band battling it out over direction and new sounds, Seventh Son Of A Seventh Son (1988) saw Iron Maiden presenting a united front and ending their extremely productive classic era on a high note that all band members seem very happy with in retrospect. Bruce and Steve, not quite seeing eye to eye (hohoho…) during the Somewhere In Time period. They succeeded in finding their way through another classic album and tour in 1986-87, and singer Bruce Dickinson remembers thinking that things weren’t too bad when they got to the end of the tour. “You know, having a little think about things. And then chatting to Steve and he said concept album, Seventh Son Of A Seventh Son. And that was it, I was off to the races then,” he says today. What do you do? Where do you look for inspiration? After one album and one world tour every year since 1980, how do you do it all over again? A good title for the seventh album was located right there, and Harris quickly got on the phone to Dickinson. Eddie scribbling his prophecy about the seventh son of the seventh son, as brilliantly conceived and rendered by regular Maiden artist Derek Riggs. The singer was fired up by the discussion with Harris and immediately started researching the theme and digging out old and unused ideas in addition to coming up with new ones. The wheels were starting to turn really quick on the new album project. Indeed, it seems that Harris was very conscious about getting Dickinson on board right from the word go, probably anxious to avoid the schism that developed between the two because of their non-communication prior to recording Somewhere In Time. 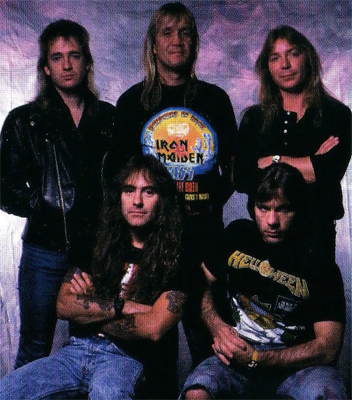 Iron Maiden in 1988, a real collaboration: Adrian Smith, Dave Murray, Bruce Dickinson, Nicko McBrain, Steve Harris. Harris turned in his best work since 1984, in this writer’s opinion, with the title track, The Clairvoyant and Infinite Dreams. Dickinson and Smith collaborated on sinister album opener Moonchild, and the singles Can I Play With Madness and The Evil That Men Do. The latter two clearly built on Smith’s outstanding songwriting for the previous album, and also featured input from Harris. The batch of songs would be rounded out with Dave Murray’s Harris-assisted The Prophecy and the harmony-heavy album closer Only The Good Die Young, one of the greatest ever collaborations between Harris and Dickinson. Click here for our retro review of Seventh Son Of A Seventh Son! It is worth noting that this was seemingly the point in time when Dickinson got interested in the occult. By now, he had the means to build his own library of history, fantasy and alchemy. All of this came in handy for the seventh Maiden record, and would also be of use when his solo career turned towards the heavier metal of The Chemical Wedding in the late 1990s. Bruce always prided himself on being well-read. Seventh Son Of A Seventh Son saw him take advantage of his millionaire means after having built his own library for reading and research. Harris felt that the Seventh Son writing sessions were impressively productive, and that the band benefitted from having a clear concept to communicate throughout the record, even if this made the songwriting process more meticulous. Of course, there is a fair argument that Seventh Son Of A Seventh Son is no more a concept album, in the narrative sense of the term, than Somewhere In Time. Dickinson himself has been outspoken about the album’s narrative shortcomings over the years, feeling that the band stopped short of what contemporaries like Queensrÿche were doing at that time. This process of writing inspiring music that didn’t quite adhere to the narrative of the chosen concept took place at home. Maiden ditched their regular writing haunt in the Channel Islands and assembled their new material in a rehearsal room on Harris’s Essex estate, working in England for the first time since their 1982 breakthrough album The Number Of The Beast. The band was in full flow, clearly reaching a creative peak. Songs were written and re-written, there was pull and tug in different directions but within a much more defined framework than on the previous album. Can I Play With Madness is one of the songs shaped by this friction – it started life as a Smith ballad called On The Wings Of Eagles until Dickinson and Harris turned it into something much heavier and more subversive. Writing completed, Maiden headed for Musicland Studios in München, Germany with longtime producer Martin Birch to record the final album of their unrelentingly prolific 1980s. Recording sessions took place in February and March of 1988, but somewhere along the way the album morphed from being a full-blown narrative concept album to simply being a collection of songs relating to the central theme of the tortured seventh son of a seventh son, a man with second sight and powers of healing who finds himself cast out and his warnings of disaster unheeded. Dickinson’s enthusiasm at the time was beyond doubt, as he called the album “a heavy metal Dark Side Of The Moon, or as close as we’ll ever get!” The world was pretty much ecstatic too. Seventh Son Of A Seventh Son became one of Maiden’s biggest ever sellers everywhere on the planet. Except in the USA. While Maiden enjoyed an extremely good year in Europe and headlined the festival tour Monsters Of Rock across the continent, their new album suffered a sales slump on the other side of the Atlantic. Somewhere In Time had reached double platinum in the States, selling north of 2 million copies. Seventh Son would stop at around 1.2 million, a nice number but a clear drop-off. Did the Americans simply don’t like Seventh Son Of A Seventh Son as much as they liked the previous album? The truth is probably a little more complex. Somewhere In Time, released in 1986, was ideally positioned to capitalise on the massive Powerslave / Live After Death success of 1984-85, and would probably sell really well just because of the delay mechanism. A couple of years later, when Seventh Son rolled out, America was in the grip of heavier and edgier bands like Metallica, the rock scene was changing, and Maiden’s mid-80s status would almost inevitably be suffering from the competition. Can I Play With Madness (seems you can if you’re Eddie) became a big single for Maiden that helped Seventh Son Of A Seventh Son sell huge amounts, despite a drop in US sales. Harris would of course agree with this analysis, maybe particularly because Seventh Son Of A Seventh Son is one of his personal Maiden favorites, and he wouldn’t easily accept what he perceived to be American rejection of Maiden’s latest studio creation. In any case, it was the first commercial sign that Maiden’s classic era, their first golden age, was about to come to an end at the close of their first decade. But the end was not there yet. 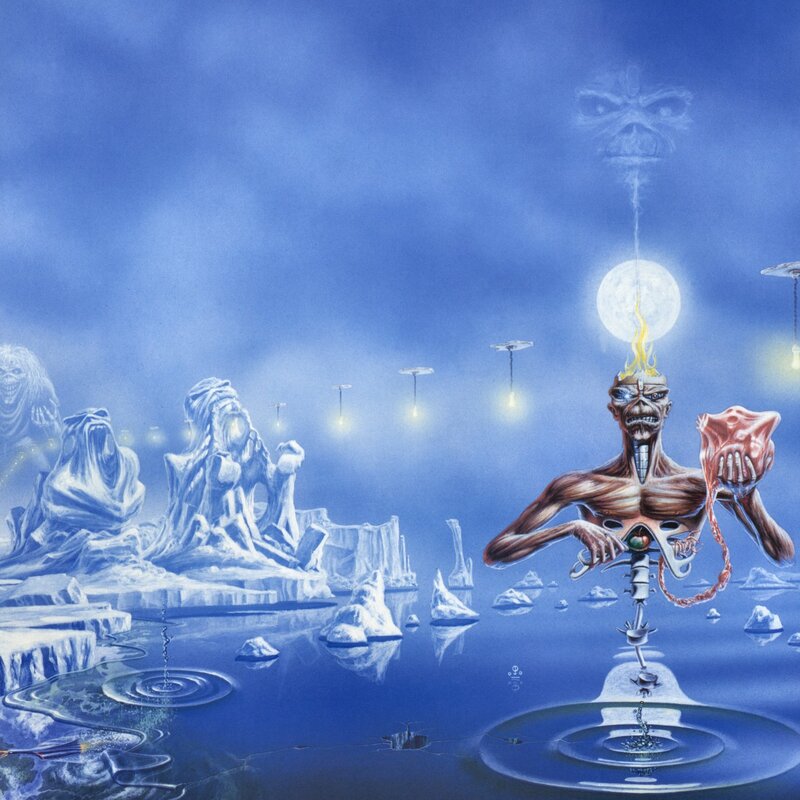 Iron Maiden’s 1988 world tour, except for the US leg, was as big as ever and featured one of their most impressive stage productions as illustrator Derek Riggs’ breathtaking vision of Eddie and the frozen river of souls was brought to pyrotechnical life. Maiden and Eddie, live on stage in 1988. Click here for our discussion of Maiden’s 1980s stage productions! The band was so pleased with their latest studio work that they actually considered playing the entire new album live, which would have been a first in their career. They ended up playing 6 of the 8 new songs, including majestic live versions of Infinite Dreams and the title track. It was the most liberal dose of new songs in a Maiden set since the World Piece Tour in 1983. The 1988 world tour even took Maiden to Castle Donington. After years of being offered a place on the bill, Maiden finally appeared at the UK’s biggest metal festival, headlining the Monsters Of Rock to a record crowd. It was their crowning glory, but sadly tinged with tragedy as two young fans had gotten crushed to death in the mud during the Guns N’ Roses set earlier in the day. Maiden had filmed nothing on the Somewhere In Time tour, probably because of the expense of film crews and post-production services in those days, as well as the relatively recent appearance of the Live After Death video. By 1988, Harris had built his own editing suite, bringing the production cost down considerably one would assume, and he wanted to direct and edit a rougher concert feature that would contrast the slicker and more expensive Live After Death. The 1988 tour would be captured on film as it climaxed on home soil at the Birmingham NEC, but for some reason Maiden decided against doing a proper live record. Fans would have to wait 25 years for the release of the Maiden England video soundtrack as a double live album. Click here for our review of the Maiden England ’88 DVD and here for our review of the accompanying soundtrack album. The Donington Monsters Of Rock festival was a highlight in 1988, but for some reason the tour was never capped with a proper live album release to accompany Live After Death from four years earlier. Seventh Son Of A Seventh Son remains one of Iron Maiden’s most celebrated albums, and one of their biggest sellers even with the US sales dip taken into account. From 2012 to 2014 the album and tour was the main focus of the Maiden England World Tour, a global trek that was the last of Maiden’s 1980s retro sets. The ultimate end of Maiden’s classic era would be the choice of direction and production that Harris and Dickinson made for their Seventh Son follow-up. Adrian Smith’s departure from Maiden at the start of that album project brought down the curtain on the band’s classic era. After almost a decade at Steve Harris’ side, Adrian Smith would be leaving Iron Maiden in early 1990 because of irreconcilable artistic differences with the rest of the band. The seeds of his discontent was sown long before, though, and he admits to feeling down about Maiden’s concerts in the late classic era. It’s clear that Adrian was immensely proud of what the band was doing in the studio when crafting Somewhere In Time and Seventh Son Of A Seventh Son, but he felt the music didn’t get the treatment it deserved on stage. Seventh Son Of A Seventh Son would be the final album of Maiden’s classic era, and the last to feature the classic 1983-90 line-up of the band. Back then, the guitarist could not shake his feelings of discomfort. Click here to read more about Adrian’s departure from Maiden! The classic era ended with a BANG, a great album and a great tour capped by a classic concert video. But the aftermath saw a distinct decline, one that Maiden would not arrest until the return of Dickinson and Smith in 1999. The dream, at least from a certain perspective, seemed to be over. Primary, and invaluable, sources for this feature: Uncredited interview at MaidenFans.com (1988), Kerrang! 183 (April 1988), Kerrang! 306 (September 1990), Metal Hammer no 20 vol 5 (September-October 1990), Stockholm, Sunday April 28 1996 (bookofhours.net, 1996), Run To The Hills – The Authorised Biography (Mick Wall, 2001), Bruce Dickinson – Flashing Metal With Iron Maiden And Flying Solo (Joe Shooman, 2007), Metal Hammer (April 2013), The History Of Iron Maiden, Part 3: Maiden England (DVD, 2013), Kerrang! : “Maiden Heaven” (2014), What Does This Button Do? (Bruce Dickinson, 2017).